I wanted to try something a bit different with the new version of Void. I decided to move away from the big, flat wedge which Void has sported for many years, and instead move to a hybrid shape that I'd been contemplating for some time. This shape was a combination of a standard wedge, a scoop, a "dustpan", and also incorporated the angled sides which I'd started using on Void 7, which were excellent at deflecting attacks from horizontal spinners. 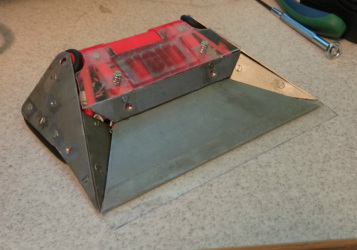 My aim with this shape was to gain much greater control over robots I was pushing; to have them between the two side spikes so they could not slide off sideways, and in the "dustpan" so they could not escape over the top. Some robots would also end up getting some or all of their bodies "beached" on the spikes, limiting their mobility. To facilitate having entirely sloped sides like I wanted, I needed to come up with a drive system that would work in the shape. What I decided on was using round synthetic rubber cord on 3d printed pulleys. This meant that the driving surface could be at the very edge of the robot, keeping Void mobile even when tipped to extreme angles, and also meant that the tracks could extend forwards, moving the turning circle towards the front and increasing traction. Unfortunately, I found it very difficult to find a material that was both pliable enough to bend easily around the tight pulleys, and soft enough to give adequate grip. The best material I could find would still not wrap entirely around the pulleys without making it far too taut to move. Even with a looser belt, the motors were drawing over 800ma on the 12v that I had originally intended to run the robot on, and so I had to drop down to 2 cells. This, combined with the fact that it still took a lot of force to make the tracks move, made the robot fairly slow and ponderous. I had also intended to have a bit more than a standard flipper. My intention was to have a mechanism that would flip the flipping arm, but then if a robot was underneath the arm when it came down, another arm would then instead lift up, hoisting the opposition into the air. Again, however, this did not work how I intended. The mechanism I designed, while fine in theory, did not work as well in practice, and could not lift anything too heavy or that was not perfectly positioned. That being said, the overall geometry of the flipper gave me some great power in it, so it was not a great loss. Void 8 managed to win both the warm-up and main competitions at AWS41. Despite being slow and tricky to control due to the tracks, the shape proved to be incredibly effective, and the flipper powerful enough to come out almost entirely undefeated. That said, I do think I was a bit fortunate; I know that if I'm drawn against some of the faster, more agile machines next time I will not come out on top, so I'm working on designing a new drive system that will fit into the current chassis which will hopefully allow me to return to the 3 cells - and thus, the high speed and torque - that I had originally intended to have.